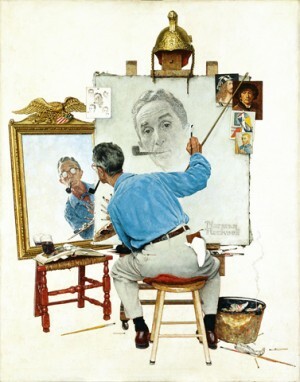 Norman Rockwell (1894-1978), “Triple Self-Portrait,” 1959. Oil on canvas, 44 1/2″ x 34 1/3″. Cover illustration for “The Saturday Evening Post,” February 13, 1960. Stockbridge, MA, July 25, 2018 – Norman Rockwell Museum will present an evening with Professor Dr. Donald B. Giddon on Thursday, August 2 starting at 5:30 p.m. Dr. Giddon will examine the visual and emotional aspects of painted and drawn portraits, discussing the art of Norman Rockwell and other artists. Dr. Donald B. Giddon, a former Dean at New York University, was also Professor of Psychology in the NYU Faculty of Arts and Science. He is now a Consultant in Psychology for the Pain Management Center at Brigham and Women’s Hospital, Clinical Professor Emeritus of Development Biology (Behavioral Medicine) at Harvard, and Clinical Professor of Community Health Emeritus at Brown University School of Medicine. Based on current research, Dr. Giddon’s talk will explore the anatomical bases of perception of facial attractiveness. The event is free for Museum members or included with Museum admission. Thursdays, July & August, 5 to 7 p.m.
Parents and caregivers can enjoy our Thursday evening programs while their children are engaged in creative art and gallery activities inspired by the works on view. $7 for children, $5 for members.